Howard R. Garris's stories of the kindhearted, resourceful rabbit gentleman, Uncle Wiggly Longears, have been an irresistible source of joy for generations of readers. These charming modern classics offer gentle lessons amid laughter as the clever, courteous rabbit ingeniously helps his animal and human friends. Jim reads an assortment of favorites from the book for this recording. 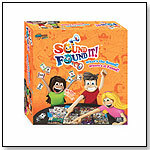 A completely new, patent-pending "two-in-one" board game, SOUND IT! FOUND IT! is both a guessing game AND a hidden-object game based on silly sounds other players make. With 96 cards and eight giant-scene boards, it's perfect for today's kids, combining visual fun with the unique twist of guessing sounds to offer hours of laugh-out-loud fun. Launch date: February 2012. — "What a cool game! If your kids like acting out (not acting up), this game is made for them. I had fun playing with Alex and her friend Lily...Alex and Lily are both tweens, but even kids a few years younger or older would love this game. Being silly is the only pre-requisite." - A review by Mike on the blog Just Find it 4 U. Tales to Play line by PATCH PRODUCTS INC. Kids can bring classic tales such as Mother Goose, The Little Engine That Could, The Berenstain Bears and Where the Wild Things Are to life with colorful game boards, including three-dimensional accessories and pawns. Each game is an adventure, much like the ones children read about in books. "No other game brings to life cherished childhood stories in the form of a board game that children will love to play over and over," Mary Dolan, public relations coordinator at Patch Products, told TDmonthly. Launch date: 2011. Awards: 2011 Dr. Toy Best Picks Children’s Products; 2011 Creative Child Game of the Year, in the Kids Games, Learning to Share category; 2011 Parents’ Choice Foundation Parent’s Choice Recommended Product Award. 100 Wacky Things by PATCH PRODUCTS INC. In 100 Wacky Things, players will do some ridiculous things while laughing uncontrollably at each other. The game has two types of cards: Always and Whenever. If you draw an Always Card, you will do the wacky thing on your card every time it's your turn. A Whenever Card directs you to do what the card says whenever another player does something specific. And we can't forget the silly props: the elephant nose, feathered boa, funny glasses and echo microphone. Launch date: 2009. Road Trip by DADDY-O PRODUCTIONS, INC.
Players must complete each word challenge and motor across the USA. "Rest Stop" cards add to the fun along the way, with lucky breaks and the occasional pothole. Road Trip game contains 120 Challenge Cards, 40 "Rest Stop" cards, 7.5" x 20" Vintage Road Map Board, 30-sided Alphabet die, and 4 retro Station Wagon movers. — As of 10/21/2011 this product had 5 out of 5 stars from 3 reviews on Amazon.com. GeoMag Kids Color - 44 pcs by REEVES INTL. INC.
Includes 24 blue and turquoise magnetic rods & 20 chromed steel spheres. Magnetic rods combined with non-magnetic spheres transform into thousands of geometric forms. If you can play business, you can learn business! 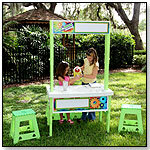 Kids will have fun earning money while starting their first business with this unique mobile business stand. The Apprentice Kit includes a mobile business office, a fun illustrated activity book to get started, and customizable banner set. The business stand comes with wheels, dry/erase magnetic banner areas, built-in locking money tray, literature storage tray, solar-powered built-in calculator, hooks, keys, magnets, and dry erase marker set. Kids can choose a business from the book or come up with their own business to launch. The book is easy to read and teaches kids how to become young entrepreneurs. Launch date: November 2010. Kids in Business around the World is an interactive workbook that offers FUN content, ideas, and hands-on learning exercises to give kids, tweens and teens the tools to start and run their own business or fundraiser. Chapters include information on goal setting, money management, and social entrepreneurship, determination and more. "This interactive workbook teaches kids, tweens and teens the foundations of entrepreneurship," Stephanie Lutz Paulauskas, marketing director at Del Visionaries, LLC, told TDmonthly. Launch date: November 2010. Crayons made from edible ingredients are hand to mouth safe. Crayon nuggets tuck into baby's palm, or can be used for stacking and building. Don't worry about petroleum or other toxic additives in our crayons; they are made with organic fruit and vegetable powders. VEGAN, no wheat, no sugar, no preservatives. Please supervise children at all times. Not intended as food. 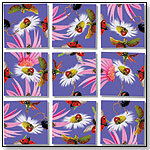 Comes in 5 organic colors: Green, Yellow, Orange, Red/Pink & Purple. Launch date: February 2011. Viewing products 311—320 out of 1181 products.